Creative guru, Mark Bongers (front left) and the creative team at DV8 Saatchi &Saatchi. The agency’s work for Tafel Lager on its mobile website has landed them a finalist nomination in the high-profile SA Loerie awards for advertising. Advertising agency DV8 Saatchi & Saatchi has been nominated as a Finalist in the prestigious South African Loerie Advertising Awards for their work on the Tafel Lager mobile website. According to Managing Director Mark Bongers, this comes as a welcome surprise after DV8’s extensive push into the digital arena this year. “Making it as a Loerie finalist is great news, especially in recognition of our digital work on tafellager.com. 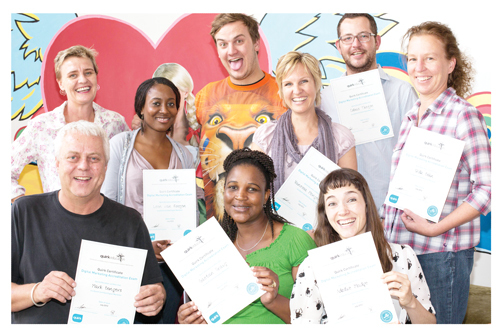 This year we decided to really take our agency digital, and this honour is a great way for us to see that the investment we’ve made is paying off.” Recently, the entire agency completed the comprehensive Quirk Digital Marketing Certificate through the University of Stellenbosch Business School, the only Internationally recognized EQUIS and AMBA Accredited university in South Africa. “Now that we’re the only agency in the country to offer fully integrated traditional and digital media strategies, implemented throughout creative and client service, media and production, we really have a huge advantage when it comes to branding and advertising,” Bongers bragged. He said although many other agencies still regard digital marketing as an ‘add-on’, it’s steadily growing in strength in the Namibian market, and needs to be treated as a core element in the marketing mix. DV8 Saatchi & Saatchi embarked on a radical transformation strategy over the past year. The nomination as finalist is the first tangible result from this process. DV8 Saatchi & Saatchi was founded in 1996 and over the past 17 years, has grown to become the leading creative advertising agency in Namibia.